One thing that we love to do more than anything is take our clients off into the wilderness; switching off from the pressures of the modern world, disconnecting from technology, connecting with nature, our families and loved ones. The African bush is the stuff of dreams, and we are in the business of making these come true! Our Wilderness Walking Camps are lightweight yet luxurious, even those who are not used to camping will enjoy this unique and exclusive experience. 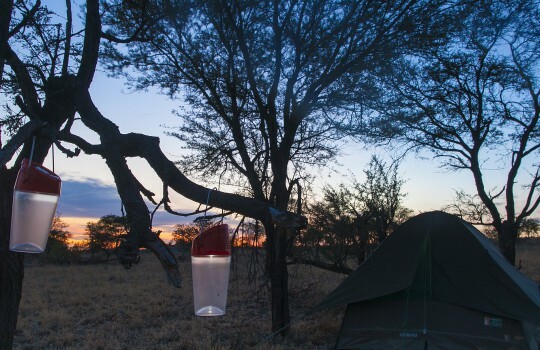 We have carefully chosen to camp in areas far from the crowds, away from the Our Guides are highly trained and confident as animal behaviorists, gun-bearers and wilderness companions. Our Camp Managers, Cooks and Crew will go beyond your expectations to ensure that you have everything that you need. We have chosen to use dome tents that are lightweight yet have enough room to stand, they are complete with beds, duvets, sheets and pillows. 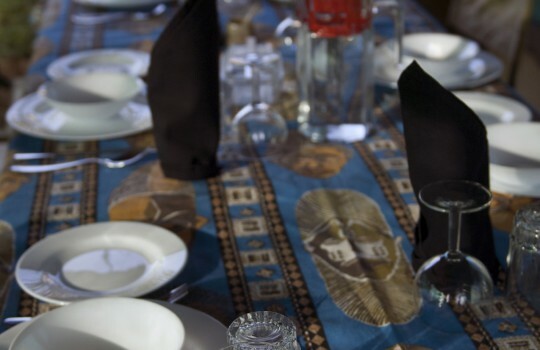 The dining room tent is fully enclosed, our menu’s are varied and can cater to all dietary needs. There is a campfire each night, complete with pre-dinner appetizers, drinks and plenty of stories! The best part is – aside from the delicious fresh food, the awesome sights, the fresh air and the new friends – that African Environments is committed to environment and providing the lightest of impact as well as having carbon off-setting available. You can feel very confident when booking an African Environments walking adventure that you are traveling with a company that truly does everything possible to be as ethical and eco-friendly. African Environments has devised a Walking Camp that will fulfill the needs of a lightweight camp without sacrificing on the luxury aspects that keep you comfortable. The dome tents are large enough to stand up in but also quick and easy for our camp crew to erect as we move camp each night of the walking itinerary. Inside, the tent has a cot bed that is raised off the ground with a 4 inch mattress, proper sheets, duvet and pillows. Outside your tent your crew will leave a warm basin of water, soap and small towel for hand and face washing as well as a bath towel for hot bucket-style showers. The Walking Camp has a fully enclosed Mess Tent where meals can be taken away from the elements if necessary, otherwise breakfasts and lunches will be set al fresco style in the splendid outdoors. A camp fire will be set, the ideal location for pre-dinner snacks and sundowners, the quintessential African scene while telling stories of the day’s adventures. African Environments has made a long standing commitment to keep the lowest possible impact on the environment. Our Walking Camps, like our semi-permanent camps, are 100% solar powered. Each tent has an individual panel with light that is charged each day while you are out in the wilderness. Our pathways, Mess Tent and Kitchen tent are also lit by solar lanterns. All water for drinking and cooking is filtered with our Katadyn water filtration systems and water is only brought into the camp that is need for cooking, washing and drinking. Our camp crew adhere to the principals of Leave No Trace when moving our camp daily during the walking itinerary, taking everything with them that has been brought in. As we are only camping for one or two nights, there is minimal impact on the environment.